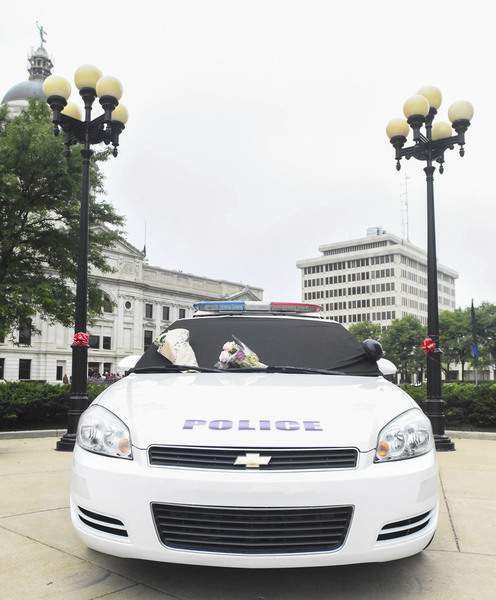 Michelle Davies | The Journal Gazette Flowers are placed on the car of Fort Wayne police Officer David Tinsley, parked at Berry and Clinton streets. Tinsley, 50, died Monday. Funeral services for the Fort Wayne police officer who died in the line of duty this week will be at 11 a.m. Monday. Services for David A. Tinsley will be at Emmanuel Lutheran Church, 917 W. Jefferson Blvd., with a viewing at 10 a.m., the Fort Wayne Police Department said in a news release Thursday. A viewing for Tinsley will also be 3 p.m. to 7 p.m. Sunday at Emmanuel Lutheran. Police said in the news release that the services and in particular the funeral procession will likely result in significant traffic delays. The procession will be from the church: East on Jefferson Boulevard to Broadway; South on Broadway to Rudisill Boulevard; East on Rudisill to Lafayette Street; North on Lafayette to Berry Street; West on Berry to Fairfield Avenue; North on Fairfield to Main Street; West on Main to Lindenwood Cemetery. Tinsley, 50, died from a heart attack Monday night, shortly after a police pursuit. He has been credited with selfless service to the community from officials ranging from Mayor Tom Henry to Indiana Gov. Eric Holcomb. Various officials have also issued public statements of condolence to Tinsley's family.